Yet owing to the institutionalized albatross of that mis-vectored history, the world is now much closer to the brink of nuclear war than at any time since the dark days of the early cold war. And the Donald has become just the latest political tourist in the Oval Office to succumb to the Deep State’s false, self-serving narrative about why the American imperium remains decamped on the 38th parallel. In fact, Washington’s suave original cold warrior, Dean Acheson, had described the Potsdam demarcation as a mere “surveyors line”. But as US/Soviet tensions heated up in the late 1940’s, the US occupation forces in the south encouraged the puppet government they had established under ex-pat and Washington dandy, Syngman Rhee, to cleanse the country of left-wing influences and prepare to eventually rule the entire penninsula. …….the Korean war started during the American occupation of the South, and it was Rhee, with help from his American sponsors, who initiated a series of attacks that well preceded the North Korean offensive of 1950. From 1945-1948, American forces aided Rhee in a killing spree that claimed tens of thousands of victims: the counterinsurgency campaign took a high toll in Kwangju, and on the island of Cheju-do – where as many as 60,000 people were murdered by Rhee’s US-backed forces. Rhee’s army and national police were drawn from the ranks of those who had collaborated with the Japanese occupation during World War II, and this was the biggest factor that made civil war inevitable. That the US backed these quislings guaranteed widespread support for the Communist forces led by Kim IL Sung, and provoked the rebellion in the South that was the prelude to open North-South hostilities. Rhee, for his part, was eager to draw in the United States, and the North Koreans, for their part, were just as eager to invoke the principle of “proletarian internationalism” to draw in the Chinese and the Russians. The last underlined sentence tells the whole story. When hostilities broke out between the two Korean sides in June 1950, Washington instantly transformed it into a proxy war against the Soviet Union and its fledgling ally in China, which had just fallen under Mao’s control the previous year. As Truman baldly put it, he was not going to loose another country to the “reds”. What we know today, and what staunch non-interventionists like Senator Robert Taft and Congressman Howard Buffett (R-Nebraska and Warren’s father) knew even then, is that 1950s style communism could take care of its own self-destruction. America only needed to militarily secure the homeland, and then wait out the eventual demise of the wretched states that had temporarily fallen victim to communist misrule. That is to say, a vastly different foreign policy would have emerged if it had been rooted in an understanding of the inherent superiority of free market capitalism and the inexorable certainty that centralized socialism would fail. Such a policy would never have been duped into the folly of a proxy war on this economically and strategically irrelevant Asian littoral. As it happened, the Soviet Union did destroy itself from within in a matter of decades. And just in the nick of time, Mr. Deng discovered that Mao had nearly destroyed China on the false belief that it could be collectivized from the barrel of a gun. Instead, Deng not only rescued Mao’s calamity by turning from firing squads to a hyperactive printing press, but spawned the greatest Ponzi scheme of borrowing, building, speculation and malinvestment in human history. It is surely a false and unsustainable prosperity, but for the moment it rings out a great irony. Rather than a threat to America’s security, Mr. Deng’s great Red Ponzi is considered by Wall Street to be the very engine of “growth” in the modern world and the suzerains of Beijing the very model of unfailing prosperity management and economic “stimulus” if, as and when needed. That begs the question, of course, as to what would have happened when the Chinese army poured across the Yalu River in November 1950 if it had not been impeded by American GIs. Would it have made any difference in the grand scheme of history if China had ended up with 35 rather than 34 provincial-level administrative units. That is, 23 provinces, 4 municipalities (Beijing, Tianjin, Shanghai, Chongqing) and 8 rather than 7 autonomous and special administrative regions. After all, had Korea ended up as number eight among China’s “autonomous and special” administrative units exactly why would that imperil the safety and security of the citizens of Lincoln NE or Worchester MA any more today than does the current Chinese rule over Guangxi, Inner Mongolia, Tibet, Ningxia, Xinjiang or even Hong Kong and Macau? So if there would be no threat now, why then? Why ever? The fact is, the seven decade confrontation on the 38th parallel is an artifact of empire, not a necessity of homeland security. It is the handiwork of a Warfare State served by a permanent political class that derives its power, purpose and resources from the faithful pursuit and stewardship of an American Imperium. Stated differently, American soldiers are provocatively stationed on the 38th parallel – where on the other side of the line they have kept the Kim family tyranny in business for seven decades – because Imperial Washington, like Rome, needs purportedly imperiled frontiers to justify its rule and heavy draft of military and economic resources. As for this guff about “democracy”: whatever the US was fighting for, from 1950, when the war broke out, to 1953, when it ground to a halt, democracy hardly described the American cause. This isn’t academic history or a wistful excersize in “could have been, should have been.” After 1960, there were numerous times that Washington could have evacuated the peninsula, but one imperial project after another prevented the return of the Korean peninsula to the Koreans to settle their differences as they saw fit. In the 1960s and early 1970’s it was the folly of the Vietnam invasion that kept the fear of falling “dominoes” alive in the Imperial City and American forces bivouacked on the 38th parallel in order to keep the two Koreas divided. Likewise, during the 1980s the giant and unnecessary Reagan defense build-up was predicated on the myth of a globally resurgent “Evil Empire” in Moscow, meaning that the South Korean frontier required military reinforcement, not the rational course of abandonment. Indeed, we recall well that the predicate for the massive squandering of resources in the Reagan build-up was that America needed the capacity to fight tw0-and-one-half wars simultaneously – the “half” war part being on the Korean peninsula. Yes, China had just been enfeebled by Mao’s famines and the madness of the cultural revolution and the Soviet economy was lapsing into the entropic decay of over-centralization and militarization. So the two-and-one-half war fighters never did say who it was that would occupy the Korean peninsula other than some variant of the Korean people. That is to say, we never once heard the claim that the vastly more prosperous, populous and industrially and technologically advanced south could not hold its own against the goose-steeping potemkin army of the north. To the contrary, the “threat” was always a new version of a theoretical proxy war that had no reason to happen, and didn’t really matter for America’s security, anyway. Then came the demise of the Soviet Union in 1991 and Mr. Deng’s massive shift to export-mercantilism a few years later to save China from an economic and civil collapse that would have ended the rule of the communist party. At that point, there was zero chance of a renewed proxy war. So surely that was the very time to bring 29,000 American servicemen and women home, thereby enabling the former Hermit Kingdom to work-out a 21st century arrangement for either the reunification of all Koreans or at least their co-existence in autonomous zones of self-governance. But that didn’t happen, either. And the reason is not hard to resurrect from the history of the 1990s. Bill and Hillary were far more intent on gaining a second term in the White House than in carrying out the assigned mandate of their 1960s generation. That is, to dismantle the American Empire and bring the possibility of general peace to the world for the first time since August 1914. So they temporized, thereby precluding a readily available peace settlement in Korea – the better to keep unreconstructed GOP hawks and newly ascendant neocons at bay. After that chance was blown, the South Koreans themselves attempted to normalize the peninsula and pave the way for an end to the American occupation. Between 1998 and 2006 they diligently pursued what they called the “sunshine policy”. And it did begin to thaw the tensions between north and south for the first time in 50 years – including humanitarian aid from the south, family reunifications and the beginnings of cross-DMZ flows of trade and investment. At length, the policy failed, but there should be no confusion as to why. The blood-thirsty neocons of the George W. Bush administration killed it in the cradle by naming North Korea to the axis of evil, when, in fact, it was an accident of history long passed its sell-by date. Rarely has there be a stupider act of foreign policy than the hideous refrain inserted into Bush’s 2002 State of the Union address by a speechwriter twit named David Frum, who apparently invented the “axis of evil” from wholecloth. That the Fat Boy ended up as an impetuous, bellicose rogue on the Kim throne in 2011 is as much the responsibility of Frum and his fellow neocon belligerents than anything else. Still, after all those blown chances to roll-back what is really an illicit forward frontier of Imperial Washington, there is still no reason for any American presence at all on the Korean peninsula. And that’s to say nothing of the massive 350,000 soldier war game rehearsal for an invasion of North Korea just completed by US and South Korean forces, as they do annually; or all of the huffing and puffing during the past week from the White House about the vastly exaggerated Korean nuclear threat. Indeed, on the question as to why Washington still has more than 25,000 troops in South Korea, we would add another. To wit, why does the US maintain a vast armada of warships, bases and military occupations throughout East Asia 72 years after Japanese empire was reduced to rubble and cinders; and also after the cold war disappeared into the dustbin of history a quarter century ago and after the red suzerains of Beijing hostaged their continued rule (and perhaps physical survival) to the daily flow of $2 billion of exports to America’s ports. As to the peninsula itself, here is the latest information. The GDP of North Korea is $17 billion and that of South Korea is $1.38 trillion. So the economy of the latter happens to be 81X bigger than the GDP of the former. Likewise, the South Korea’s population of 50 million is 2X larger than the North’s 25 million. And that’s to say nothing as to South Korea’s advanced technology, millions of skilled industrial and tech workers and absence of the abject poverty and even starvation which is rampant on the northern side of the DMZ. So how is it that a nation that has been growing by leaps and bounds for a half-century cannot defend itself from a two-bit industrial backwater run by a certifiable lunatic? Why is it that no one in Washington has bothered to notice that since 2002 South Korea’s economy has grown every four months by more than the entire current GDP of North Korea? The argument for the huge US presence in South Korea, of course, is that it provides a trip-wire deterrent that puts the North Korean ruler on notice that an attack on South Korea is an attack on Washington. But with respect to a potential conventional attack, that’s just plain malarkey. If South Korea with 81X the economy, twice the population and infinitely more industrial base and technological sophistication can’t or won’t defend itself from the “potemkin” economy and military north of its border, why should the American taxpayers and soldiers be called into the breach? And “potemkin” is the right word for it. Most of North Korea’s military equipment is 40 years old and is more suited to internal repression of uprisings, not offensive action against the South. Thus, one of the few new aircraft it has purchased since the 1980s is the Russian Su-25 Frogfoot, which is a ground-attack aircraft similar to the American A-10. Needless to say, South Korea’s modern F-5, F-15 and F-16 fighters would turn the slow and heavy Frogfoots into an exercise in shooting fish in a barrel. Then again, the real job of the Frogfoots is not to attack South Korea anyway; but they are just the thing to put down a coup by other North Korean forces. Likewise, the 1,000,000 soldiers in the Korean People’s Army spend more time as conscript construction labor and get far more practice with shovels than Kalashnikov assault rifles; some of them are also quite skilled at goose-stepping parade entertainment for the country’s otherwise catatonic masses, as we saw this past weekend once again. Yes, Kim Jong Un allegedly likes to play with nukes, but even this whack job must recognize he has a small problem. Namely, North Korea has tested underground five tiny nuclear bombs so far (2006, 2009, 2013 and two in 2016). Yet none of them appear to have been even a “boosted” fission bomb, let alone a thermonuclear (fusion) warhead. Indeed, the range of estimates put the latest explosion in September 2016 at about 10 kilotons or slightly smaller in size than the bomb dropped on Hiroshima in August 1945, code-named “Little Boy”. Needless to say, Little Boy was not delivered by a sea-based or land-based intercontinental ballistic missile, and not just because neither had yet been invented! 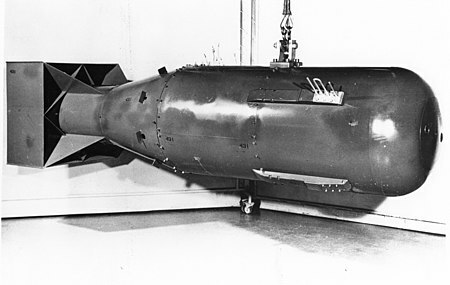 In fact, it was dropped from bay of Enola Gay, a B-29 bomber, because, as is self-evident from the photo of Little Boy below, it was just an A-bomb, not an H-bomb. It was therefore way too big and bulky to fit in the nosecone of a missile, even if the US had possessed one. That is, to miniaturize a nuke sufficiently to get its weight and size down to missile-riding scale, it needs to be a thermonuclear device. Here’s the thing. The Fat Boy of Pyongyang doesn’t have one; he’s still at the Little Boy stage. In fact, what he has tested so far would have to be delivered by one of his 50-year old Soviet era Il-28/H-5 bombers, which amble in the sky at slow speeds and low altitudes and would be shot down by South Korean fighters or air defenses in a heartbeat. That is to say, at the moment the only thing the Fat Boy can actually vaporize is his own country. There’s that, and with respect to the CNN War Channel hyperventilating about a putative nuke attack on California, there is the further fact that the Fat Boy is not remotely close to having a long-range intercontinental missile that could deliver a thermonuclear warhead, if he had one. So far, North Korea has developed and tested three longer range missiles including Taepodong-1, which has an estimated maximum range of about 1,500 miles; and Musudan and Taepodong-2, which have estimated maximum ranges of 2,000 miles and 3,500 miles, respectively, none of which get you to the Left Coast. Moreover, Taepodong-1 has had just one known test flight. Way back in April 1998, a modified space-launch configuration of the vehicle lifted off with a small satellite onboard; the launch failed. The Taepodong-2 failed during a 2006 test flight, its only known liftoff. Later, North Korea modified that missile into the Unha space launcher, which lofted satellites to orbit in December 2012 and February 2016, but it is not longer even in military service. The Musudan has seen a lot more test action. North Korea apparently tested the medium-range missile seven times last year, and all except one blew-up at launch, as did the Sunday launch, or within a few hundred kilometers of flight. Yes, if you set a thousand monkeys at typewriters long enough, they will supposedly type the New Testament. But at this stage of the game there is no urgency whatsoever about any danger to the homeland, or even Japan or South Korea from a preemptive nuclear attack by Fat Boy. So instead of ‘running out of patience” as the Trump Administration has proclaimed, now would be the time to do the opposite. That is, recognize that the Empire’s frontier on the 38th parallel has been a needless provocation for 67 years, and that it is still not too late to abandon these pointless outposts. Indeed, if the Chinese are to take the lead in denuclearizing and politically normalizing the peninsula, getting American forces and weaponry out of there is the essential first step. In fact, South Korea is about to elect a new government under Moon Jae-in, the Democratic Party nominee. Moon has said he would review the previous South Korean government’s decision to host the American THAAD missile defense system and would seek a meeting with North Korea’s Kim Jong Un in Pyongyang as a priority over going to Washington. That is, with the distinct possibility of South Korean politics shifting back to a Sunshine Policy, why should anyone be surprised that the Deep State is suddenly beating the war drums about a false, imminent threat of a nuclear attack by North Korea? The irony is that the Donald should understand this better than most. After all, it amounts to a blatant attempt by Imperial Washington to “meddle” in the upcoming South Korean election! Unfortunately, the Donald is surrounded by generals and national security apparatchiks who have spent a lifetime defending the frontiers of the American Empire, and are not about to see the light now. So yet another chance for peace is being turned into an opportunity for imperial aggrandizement. Still, even if US national security did require giving South Korea a shield of nuclear deterrence, which it doesn’t, that still does not necessitate the 28,500 US military personal stationed there – to say nothing of the vast US armada on the Pacific rim described above. The fact is, North Korea could be turned into a parking lot by the payload of a single Trident nuclear submarine lurking safely out of harm’s way in the deep Pacific. To wit, each of the Trident’s W88 warheads yield about 475 kilotons of destructive power or about 30 times the yield of the latest North Korean test. But here’s another thing. Even after accounting for current treaty restrictions, one Trident submarine can carry 20 missiles with 8 warheads on each missile. That means just one of the Navy’s 14 Trident submarines can deliver 76,000 kilotons (160 warheads X 475Kt each) of nuclear payload. That’s 4,000 times more than “Little Boy” delivered to Hiroshima in August 1945. And it’s also 4,000 times more than Fat Boy can deliver by slow bomber today! In short, if the job is actually deterring Kim Jong Un’s nuclear fantasies, the whole matter could be handled by permitting the South Koreans to rent the services of one Trident submarine. And that could be done for far less than the $1 billion per year they are now paying to help defray the massive cost of the 29,000 US troops stationed there and the huge infrastructure required to support them in combat ready modalities. The case of the lonely Trident sub lurking deep in the vast Pacific, of course, raises an even bigger question. Why in the world is there still 54,000 troops and 50,000 more dependents and civilian contractor personnel in Okinawa and Japan spread among 85 different military and other facilities – since these “hostages” to the whims of Kim Jong Un are also offered up as reasons for provoking a nuclear showdown on the Korean peninsula? After all, the Japanese did agree to unconditional surrender after two of their cites were fried alive in August 1945. Hardly an ill-word has been spoken against America in the Japanese Diet or halls of government since. So when it comes to the question as to why the American Imperium is still implanted from Singapore to Okinawa and the Japanese Islands and why the Seventh Fleet – and its 80 ships, 150 aircraft and 40,000 sailors – continuously and massively patrols the blue waters surrounding the eastern shores of the Asian continent, all roads led to an even more preposterous reality. To wit, Washington is apparently protecting East Asia from the Red Suzerains of Beijing, who the Donald is now imploring to help reel in the Fat Boy of Pyongyang! Yes, the pursuit of empire weaves a wretched plot, as it has on the Korean littoral for 67 years running.